​The Muslim Youth and Family Support program is funded by the Department of Family and Community Services under the Early Intervention & Placement Prevention (EIPP) program. Muslim youth (12-17yrs) and their families are able to access services early where appropriate short term supports are provided to meet identified issues and prevent problems from escalating. The program provides direct and support services, as well as a variety of programs for Muslim youth and their families. The program has been succcessful in delivering much needed sevices. Muslim Youth and their families have benefited from the services and activities provided by achieving intended outcomes. The males youth support groups are conducted every Tuesday night and the females youth support groups every Monday night. Guest speakers vary. Youth from 12-20 every meet to discuss general youth issues, such as social, religious, personal, health, education, responsibilities, rights, relationships, drug etc.... The support group sessions assist in creating a comfortable environment, which allow participants to express freely their feelings and problem and gain information and advice. Every Sunday afternoon, the boys get together at Bexley Oval to have a game of Tackle and touch footy.. No matter what the weather is like, the boys just love lacing up their boots and having an enjoyable footy match. Our Muslim youth were also involved in indoor soccer tournaments where one of our teams was crowned champions while the other team were runners up in a very tight match against a tough opponent . Indoor soccer is still running once a week. We also had outings to the National park during the summer season once every fortnight; we would go down to Garie beach from early in the morning for a bbq, a swim and fishing. Later in the afternoon we would then go up to Wattamolla which is also located in the National park for a gathering and afternoon tea. Other social activities include some of the Saturday nights where we get together whether it is at someone’s house or at a cafe, a game of counter strike, going out to eat at a take away shop or a restaurant. 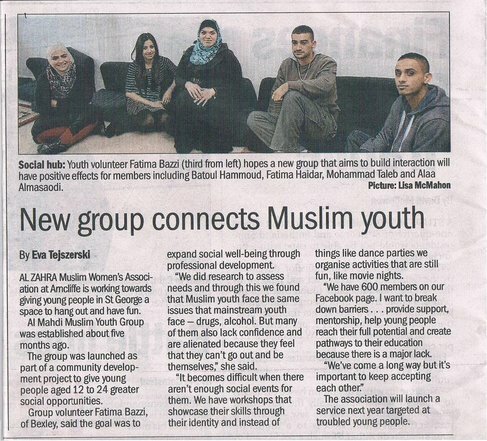 One of the major achievements of our youth program was the formation of the Al Mahdi Muslim Youth group to plan for future activities meeting the needs of our local Muslim youth. The group’s committee consists of 13 female and male active youth members. One of the group’s first achievements was the opening night which introduced the group to our community, in particular our youth, with approximately 150 people including parents and siblings in attendance. The night included a dinner, presentations, special guests Champion boxer Nader Hamdan and Champion kickboxer Adam Adeen, who encouraged youth to have confidence in themselves and strive to achieve their goals, a very enjoyable role play by the Al Mahdi Muslim youth, and valuable prizes. We have received encouraging positive feedback about the event. ​​​​​​​​​​​​​​​​The group also worked with a professional film and theatre director on producing a video clip showcasing the activities and members of the Al Mahdi Muslim Youth. The clip is still being developed and will be finalised in the near future. ​​Check out our Facebook page – Al Mahdi Muslim Youth which has up to 600 members with new members joining the group after the opening night. ​Tues. Information, referrals, support and other services 9.30 pm - 1.30 pm. & Youth support group for males @ 7.30 pm. Sun. Rugby , Soccer for boys @ 3pm.